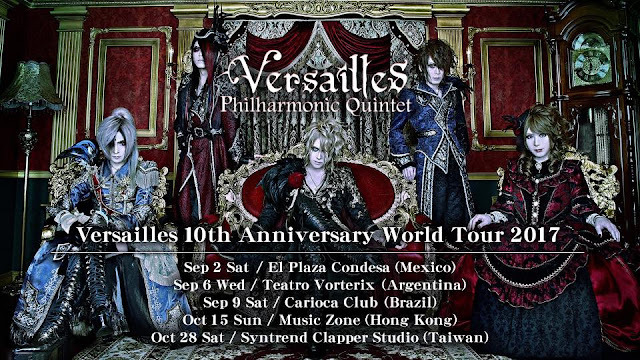 Versailles Announces Fall 2017 World Tour | VKH Press – J-Rock & Visual Kei Coverage Worldwide! In early 2017, newly-reformed Versailles brought their symphonic rock sound to live venues across Europe, and now they've announced plans to extend their reach across five more world countries. Versailles 10th Anniversary World Tour 2017 will feature shows in Asia and Latin America, making for a brief five stop tour running through September and October. Fans in these countries have waited since 2011 for another visit from the vampiric quintet, and the band is promising to make up for lost time now that they are able to return. -- Tickets go on sale Monday, June 12 - Ticket information here! -- Tickets go on sale Wednesday, June 7 - Ticket information here!